Drum majors at the 2012 leadership summit in Chicago. During the off-season, drum majors of Open and World Class corps are invited to Drum Corps International's winter business meetings for a leadership summit. Over the three-day seminar, drum majors participate in a series of interactive activities and discussions that are designed to hone leadership, problem solving and time management skills, while helping them build a support network among their peers that transcends competition on the DCI Summer Tour. Through the Arts Council of Indianapolis' Power2Give program, Drum Corps International is collecting donations to cover the cost of travel and housing for the drum majors who will attend Jan. 25-27 in Indy. To contribute to the future of DCI's remarkable student leaders, visit Power2Give.org today. Learn more at Power2Give.org. 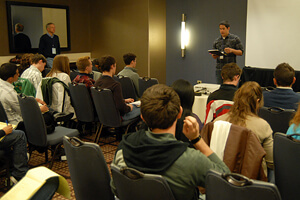 Learn about the 2012 drum major leadership summit.